Studies show that people with PD benefit from exercise to improve strength, flexibility, balance, overall fitness, and quality of life. Yoga, which includes deliberate movements, meditation, and focused breathing, may be a viable means of providing such exercise and relaxation. Studies specific to yoga and neurological conditions, particularly PD, are limited. However, individuals with Parkinson’s appear to be more open to ways of managing their health and fitness through yoga and other complementary alternatives than ever before. See below for a listing of classes in your area. Instructor Heather Tharpe teaches class participants postures, form, and breath work, while helping them build physical strength, flexibility, and balance. Comfort and safety are ensured through the use of chairs, the wall, and other exercise equipment to accommodate individual variations and modifications. Class practice closes with a restorative moment, paired with mindful breathing. The Parkinson’s Disease and Movement Disorders Center at Beth Israel Deaconess Medical Center presents PD Yoga. Classes are taught by a certified Yoga instructor with special training in PD. There are many benefits of yoga, which include a balanced relationship between body and mind and increased vitality, positivity, and peace. This Hatha yoga class improves balance, strength, and flexibility. All levels of Yoga experience are welcome. Keith Beasley has studied, practiced, and taught yoga and meditation for more than a decade. He is a registered yoga teacher (RYT 200) with the Yoga Alliance and has completed an APDA sponsored yoga teacher training designed to address the needs of students with Parkinson’s disease. Keith’s classes emphasize increasing flexibility and strength, improving balance and postural alignment, boosting mental concentration, and promoting deep breathing. This program includes functionally based exercises, both seated and standing, as well as selected yoga postures and breathing exercises to address the earlier symptoms of Parkinson’s disease. 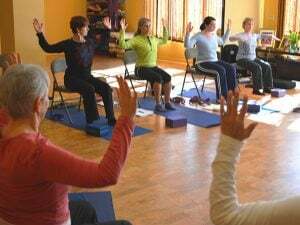 This program is led by certified yoga instructor and physical therapist Nanci Winterhalter. Gentle Movement, Dance, and Yoga for Parkinson’s Disease with Donna Brooks include seated and supported dance, stretching, and vocalization to improve dexterity, strength, balance, walking, speech, flexibility, motor control, and rapidity. You can feel better, calm anxiety, and experience meaningful camaraderie. Click here to see a flyer. This yoga program at Northeast Rehabilitation Hospital in Salem, NH is designed specifically for people with Parkinson’s. This program runs two times per week in six week sessions. Contact Northeast Rehab for more information about the next session. Every Body Balance is happy to provide both 1-on-1 Needs Assessments and 6-week (12 class) sessions of Yoga for Parkinson’s. This class is designed to help people with Parkinson’s or other movement disorders improve their flexibility, strength, balance, alignment, movement, and breath control. Every Body Balance recommends individuals receive a 1-on-1 Assessment before joining the group classes. For more information on session times, please contact Every Body Balance using the information below. To see a brochure, click here. For more information on Every Body Balance, click here to visit their website. This yoga program is designed for individuals with Parkinson’s disease and their partners/caregivers. A combination of seated and chair-assisted poses will help improve strength flexibility, and balance. For more information, please click here.